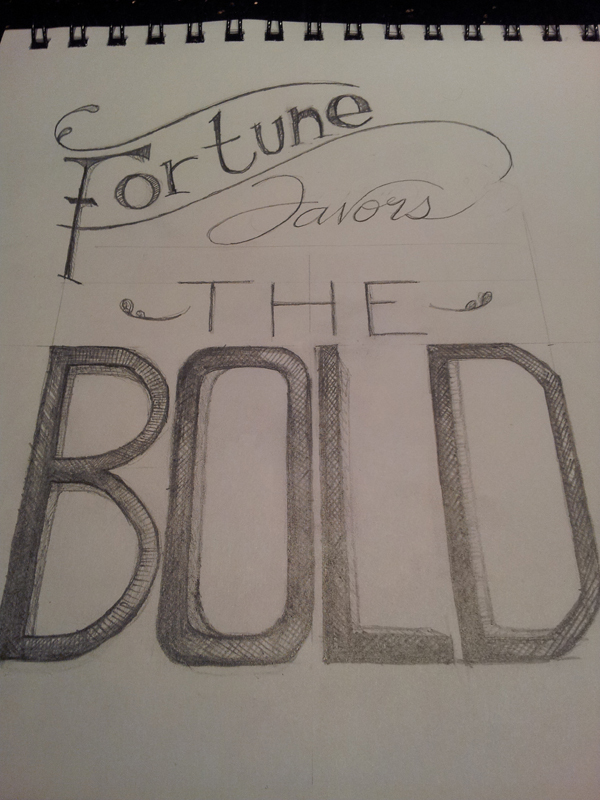 As a part of a lettering class, I decided to try my hand at expressive lettering this week. Expressive lettering tells a story the goes beyond its font. 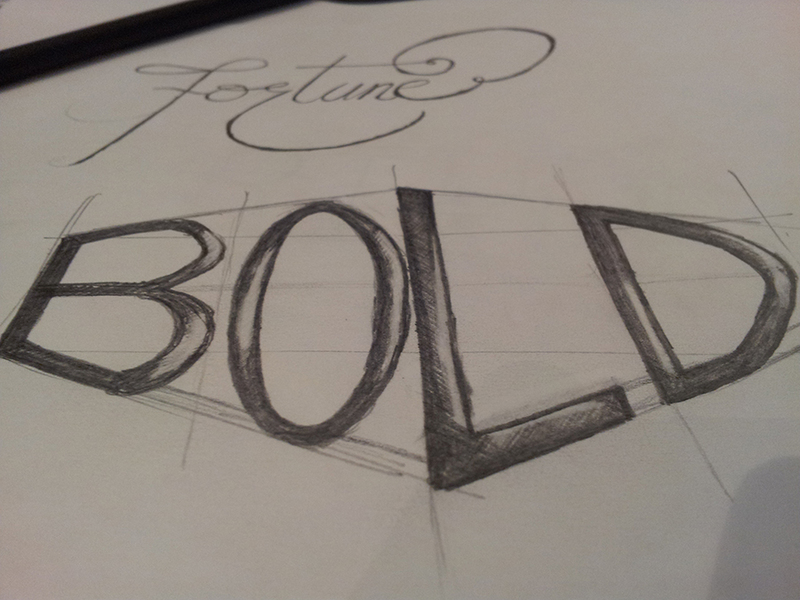 At its root, lettering is basically the art of drawing letters…by hand. There’s some (black) magic behind the scenes nowadays with the assistance of computers, but for the most part, hand lettering is still a practice first begun with a pencil and piece of paper. The second step was to create a word map filled with words or phrases that came up while I researched the phrase. It’s a brainstorm, so everything is okay! 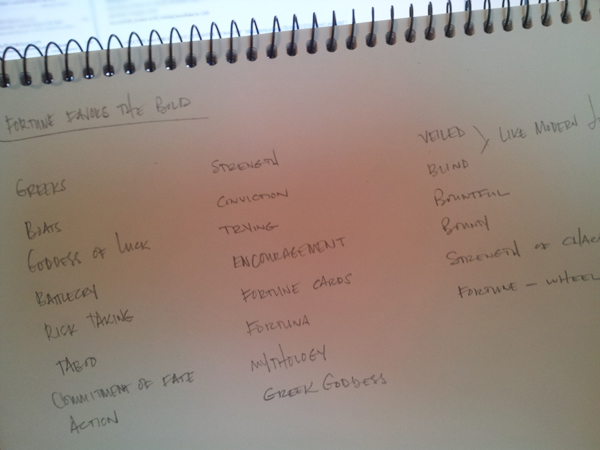 The next step was to gather bits of inspiration. 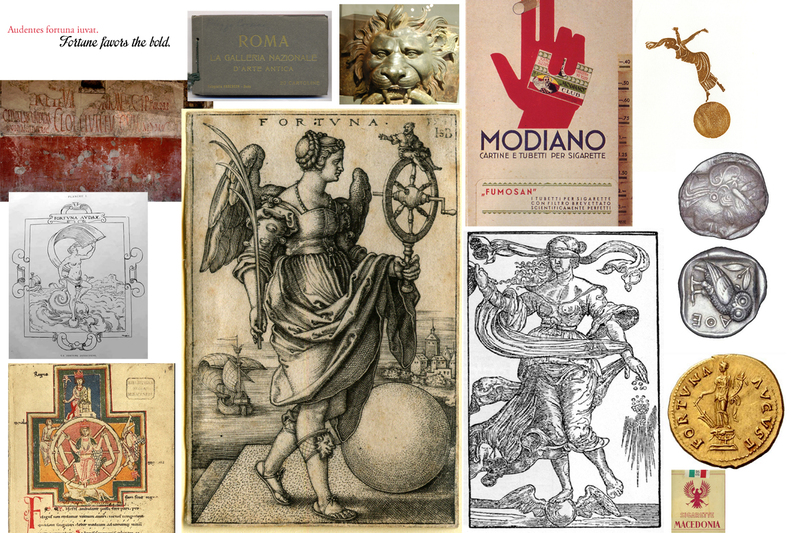 Everything from ancient Roman coins to cigarette pack design from Italy in the 1960s works for my overall theme. Even if an idea is later tossed out, everything helps flush out what I’m really trying to say/accomplish even if it’s just by eliminating what I end up not liking. 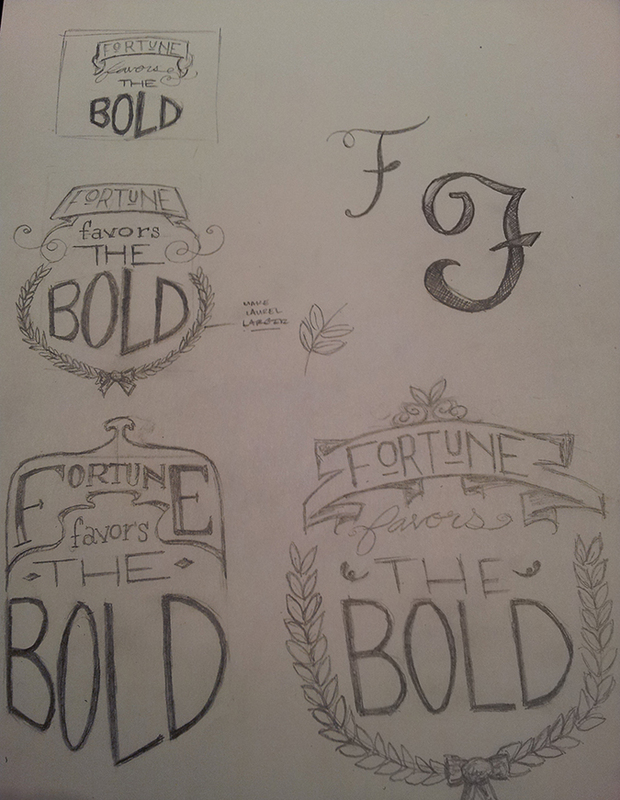 The last step for the day is to do 5 style sketches of one word from my phrase. 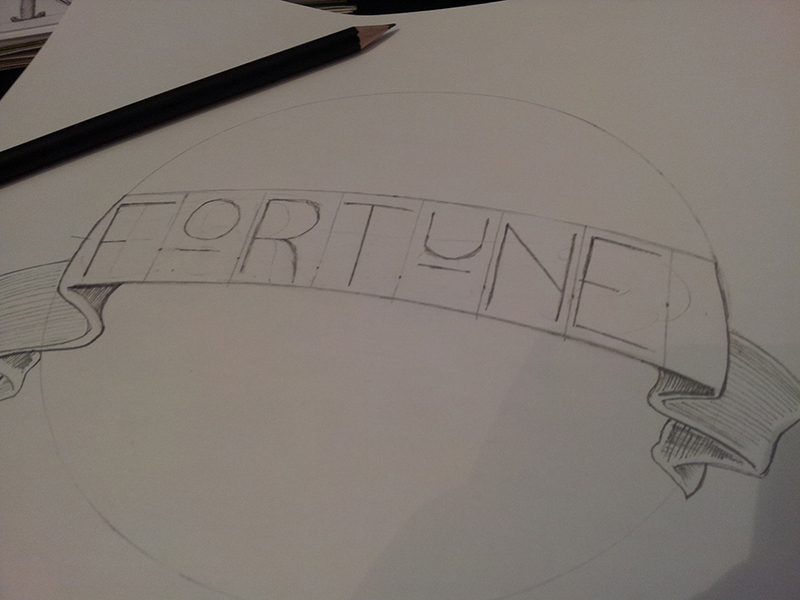 Because “Fortune” is the most important word in the phrase (all hail Goddess Fortuna), I decide I’ll do some sketching of it. The sketches are brief – about 10 to 15 minutes each – and are meant as a warm-up exercise to get the mind and hand working. Before I get started creating design thumbnails, I spend a little more time playing with word styles. It’s a fun exercise and I get some practice following curves, creating banners, and using some other tools. When I start creating thumbnails, I have to resist the urge to add in too much detail. I love everything in miniature (who doesn’t? ), so the temptation to keep adding and refining is strong. I remember that the point to the exercise is to try many different configurations and styles so I can – quickly &at a glance – decide what I like, what I don’t like, what works and what doesn’t. Out of all of the thumbnails on this round, I really like the flared banner on thumbnail #2 and end up hating all of the laurel. Too much! It breaks up the design and draws attention away from the letters. 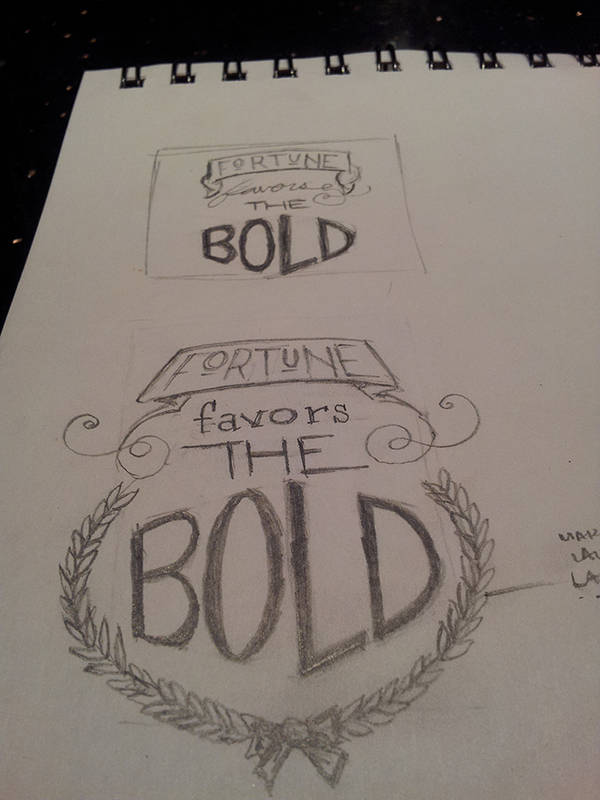 I’m also done with the style I’ve selected for the word “BOLD” and will iterate to create something new/fresh. I’ve thrown out the previous letter shape treatment of the world “BOLD” and have opted instead to give it height and a drop shadow. I like it – it needs more shading, but it’s good enough for a thumbnail. 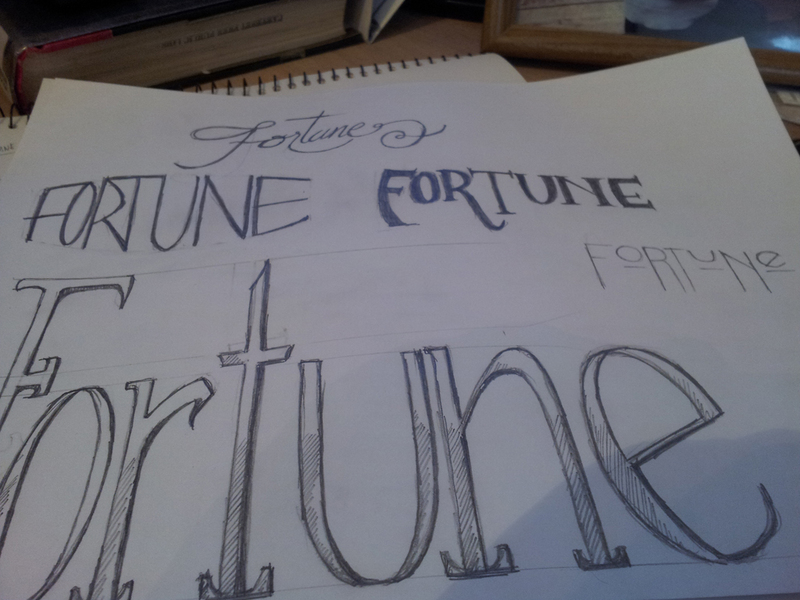 I’ve also taken the word “Fortune” into a different area, giving it a slightly monetary feel – clearly the kerning needs adjustment, and if you’re like me you’re probably sitting there staring at it with the uncanny feeling of “wrongness”! Instead of the heaps of laurel, I’ve incorporated smaller ornamentals with a slight foliage feel to them. Love this change and will draft another set of thumbnails with variants.